Fremont Peak Park at N 45th & Palatine N was three houses in the woods in 2001. Photo Credit: unknown Helicopter pilot? Fremont Peak Park (FPP) was the precursor to Urban Sparks. Jack Tomkinson and Karen Moe, members of the FPP steering committee, were so moved by the experience of creating this park and receiving guidance from park instigators from around the city that we started Urban Sparks to capture and share the hard-earned lesson from successful project leaders. We thought more people would do public work if they knew that it was within reach and if they knew where to begin. Jack had been coveting these properties for several years, so the day the properties went on the market, Jan 26, 2001, he stopped to take a look at the view from inside the house. Breath-taken, he thought, Cliffs of Monaco, Eiffel Tower, this is one of those world-class views. This should be public! Troubled by the many beaches, hilltops and last places he’d seen developed, he thought, “We have to think differently about these places.” Then he realized that he had just nominated himself for the job of trying to turn this place into a park. He wouldn’t have felt right developing it for himself. This park had a very unusual beginning. 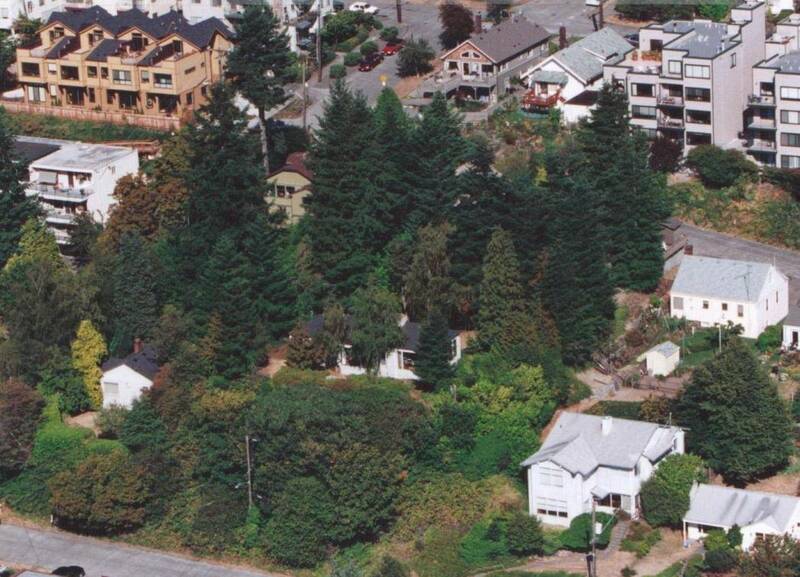 Being one of the nicest small estates available in Seattle, it wouldn’t last. However, Donald Harris, real estate manager for Seattle Parks and Recreation said, “We’re interested, but you need to get it off the market since we can’t possibly move quicker than 6 months.” Now what? Carry on making phone calls and meeting people. 7 days after the property was listed, Jack went to the Fremont Chamber of Commerce meeting. He told them, “Parks will be there in an hour to look at the site, but they can’t buy it in less that 6 months and now there’s an offer on it from someone else. This is just a crazy idea someone had once if I can’t find an angel. You all know who cares about this community and who has money. I’m looking for an angel who can immediately buy this $1,375,000 property and hold it for up to two years, while the community raises the money to buy it back.” After a short silence, Suzie Burke piped up. She said, “Now that’s a good idea. I’ve heard some stupid ideas about trying to turn commercial and industrial properties into parks, but parks should be in the neighborhoods where the families are. Ellen (Sass, president of the North Star Bank) – would your bank put up the loan if I secured it and paid the interest?” Ms. Sass said, ” We could do that.” Suzie said, “Let’s do it. Let’s throw ourselves in front of this train. Jack, I’ll buy it and I’ll sell it back to you for exactly what I paid for it; now go get the money. 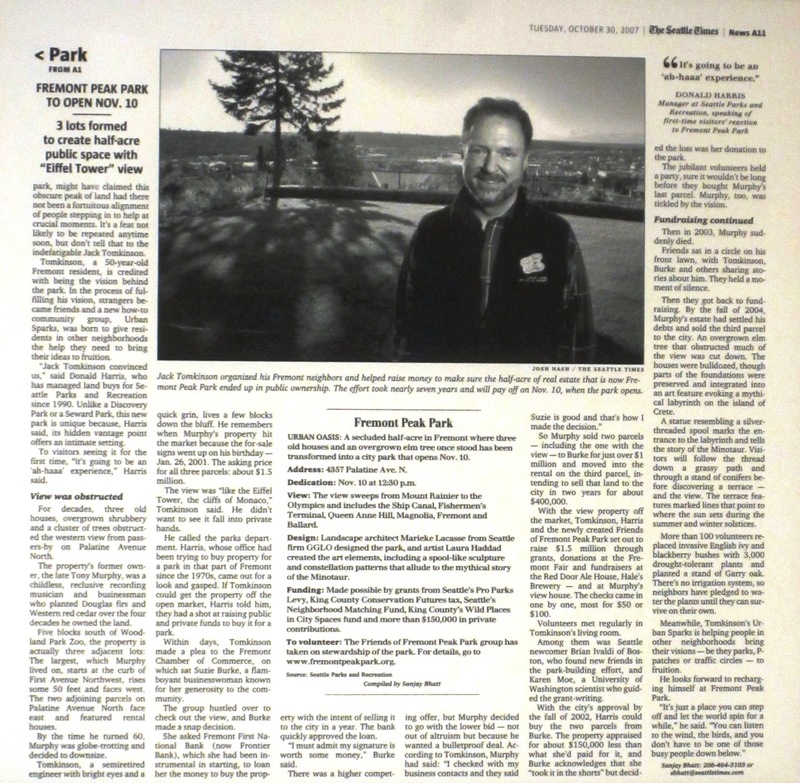 If you fail, I know who I’ll sell it to.” Mouths around the table fell open and Fremont Peak Park went into high gear. Thus started the 7 year effort of building community support, writing grants, learning about city and county budgets and levies, learning to speak publicly while carrying the 6 foot long panorama. We built a team and began meeting in April. None of us had done anything like this before, so we networked like crazy and learned as fast as we could. We celebrated the purchase of the first 3/4 of the property in July 2002 and we partied. 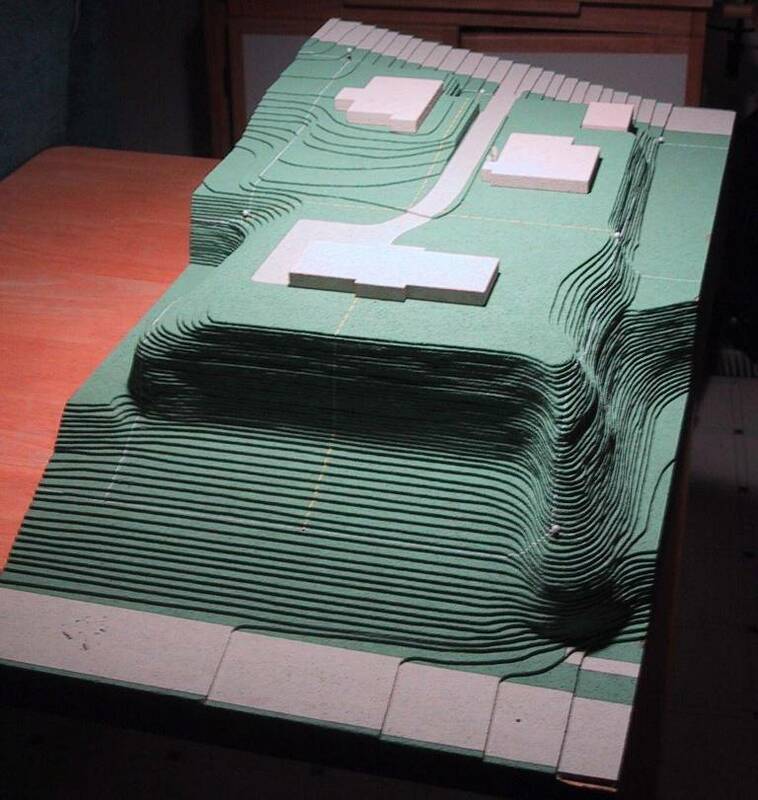 Every project seems to have its surprises. Ours was 9-11, 2001. 9-11 did a number on the property values all across the country. It hit us hard and pushed the appraised value to well below what Suzie had paid for the property. Since the money we raised (the full amount) went to the city and the city can only pay appraised value with the citizens’ money, we had a problem. Suzie knew it and when it came time to sell the property to the city for the park, she told Donald, “let’s make this work; I’m going to sell it to your for $150,000 less than I paid for it.” Problem solved. If you like our park, thank Suzie Burke for saving the day and allowing us to finish the job. Suzie continued to support us with connections and cheerleading all the way through to opening day. Fast forward (to be back-filled later)… Having gathered about 15 total steering members over time and crossing the finish line with 8, we bought the remaining 1/4 of the property, designed the park with artist Laura Haddad and landscape architects GGLO, and built it, unveiling it in November 2007. 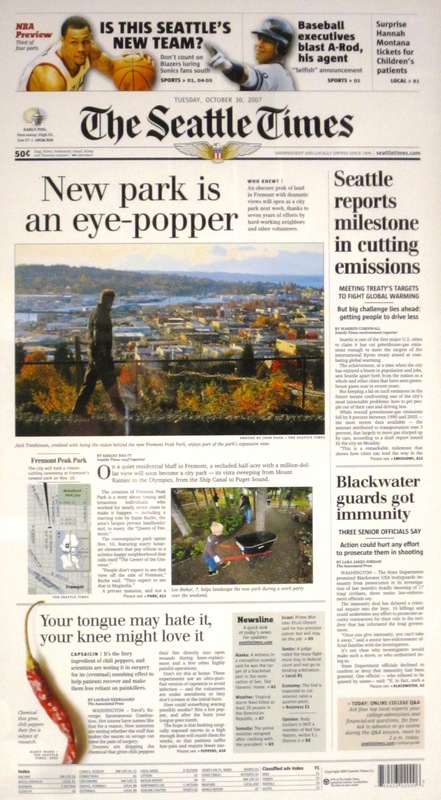 It was a huge thrill to have the announcement be a front page article in the Seattle Times above the fold and above the story about the Blackwater guards in Iraq receiving immunity from prosecution. Volunteer work made top billing for a day! The Olympics and clouds play well together at Fremont Peak Park.